Ah, the antibiotic resistance problem again. 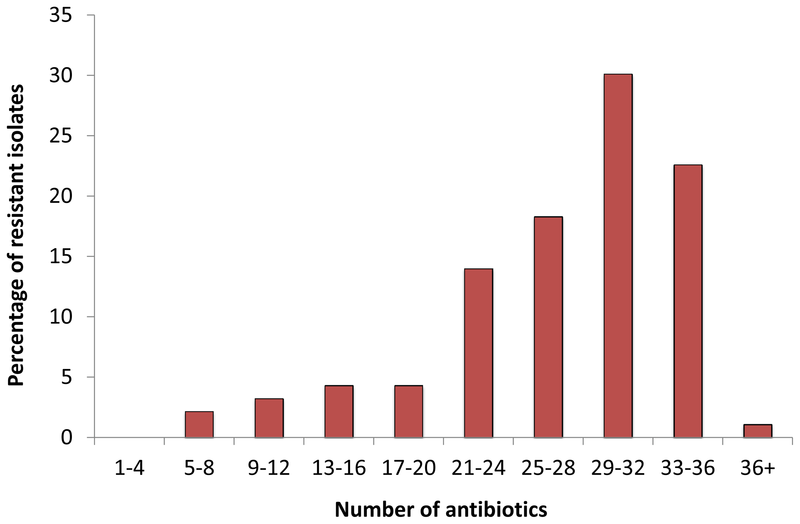 Yes, we know that antibiotic overuse-both in humans and in agriculture, contributes. This is not surprising. But how does our built environment contribute to the spread of antibiotic resistance genes? The built environment is a perfect place for host and environmental microbes to collide and share gene, including antibiotic resistance genes. Wastewater treatment plants are a particularly good meeting point for microbial gene sharing. Wastewater treatment plants are not a new topic in the antibiotic resistance field-they have been studied before, and antibiotic resistance genes have been identified in them before. However, a 2013 PLoS One study is a bit different in terms of the frightening amount of antibiotic resistance genes identified and the capacity for horizontal gene transfer among the bacterial species present. Additionally, class 1 and 2 integrons (genetic elements that promote horizontal gene transfer) were detected in 80% and 95% of bacterial strains, respectively. qPCR confirmed an unprecedented high level of integrons among the strains isolated from the treatment plant. These results are particularly troubling, especially considering another study, which has shown that river sediment contaminated by effluent from this same wastewater treatment plant harbored bacteria with resistance genes to several classes of antibiotics. Like other studies that have extrapolated and inferred the spread of antibiotic resistance in wastewater communities, the results of this study will be refined and confirmed by detecting and demonstrating active horizontal gene transfer between bacterial members of the resident sludge microbial community. Nevertheless, the amount of antibiotic resistance and the level of the potential for horizontal gene transfer in the PETL wastewater treatment plant are sobering realities that must not be ignored. Pingback: Antibacterial Soaps Still Terrible – microBEnet: the microbiology of the Built Environment network. Pingback: How to Deal with Superbugs in Waste Treatment Facilities – microBEnet: the microbiology of the Built Environment network. Pingback: Fish Want Probiotics Too – microBEnet: the microbiology of the Built Environment network.